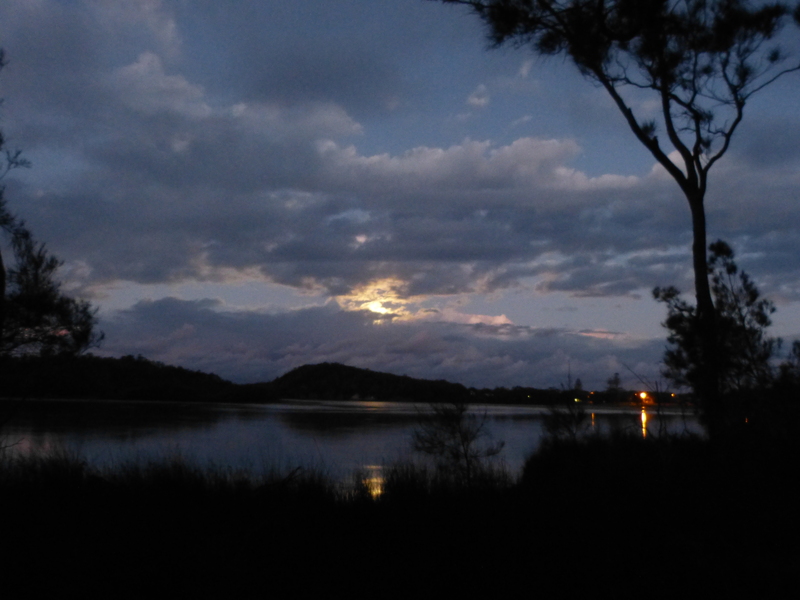 On Full Moons, Willie Wagtail and Early Mornings. Moonrise over the Corindi River. When there’s a full moon, Willy sometimes sings through out the night. He twitters and scrapes in the backyard outside our window, a sweet song that reminds me of cold clear water washing over stone. Lately, in the early morning the butcher bird joins in. The butch is further off, his song is clear melodious fluting…startling pure piping tones off in the distance. Willie Wagtails are one of my favourite birds. I love their song. I love the way they dance and spin above the ground to flush out insects. I love their black feathers and tail and their white breasts. I love the little white eyebrows above their gleaming black eyes. They remind me of a little old men dressed in a tuxedos. I hate it when I find a pile of black and white feathers on the ground and it pisses me off that people don’t keep their cats in at night. Willies often hunt at night and flutter close to the ground flushing up insects to eat. Like much of Australian birdlife they are exceptionally vulnerable to marauding cats. Mr and Ms Willie are living in our back yard. We’re pretty certain they’re nesting in one of the golden canes that line our back fence. We know this because Mr and Ms Willie sing their soft little song early in the morning. They often start just before 5:00. They wake Shadow, and she tromps noisily around the house and bangs through the doggie door announcing that she thinks it a damned good time to get out of bed and go for a walk. Julie and I think it’s a damned good idea to start Daylight Savings a bit earlier. Willie Wagtails are exceptionally active and vocal when there is a full moon. I don’t know why. I can only think that bug hunting is more productive on a full moon or maybe Willie is just celebrating because there’s more light. The last few days Mr and Mrs Willie have been fluttering around one of our large terra cotta lanterns that hangs from our verandah. We haven’t lit the lantern in a long time and every opening is filled with spider webs. I thought at first they were stealing the packaged insects caught in the web. I even remarked to Julie one morning when we were sitting out on verandah having breakfast that Willie managed to get her beak all covered in sticky web. It occurred to me a few days later that Mr and Mrs Willie probably weren’t really into eating desiccated insect husk but were collecting the sticky web to assist in building their nest. The terra cotta lantern is totally web free now. We often have wattlebirds nesting in our yard. In fact sometimes they nest in a wicker lantern that hangs from the ceiling on the veranda, but this is the first time we’ve had Willie Wagtail nest in our yard. I’ve yet to see the nest and I don’t really want to disturb them by trying too hard and despite their early morning singing, we’re just glad they’re here. I’m not certain what this was intended to be…but I know what I want it to be. It’s to be an eclectic mess of ideas, happenings, politics, books, films, television, food, booze, nature, the environment and whatever makes me feel good or pisses me off, what gives me hope and what leads me to despair…a dog’s breakfast of ideas, events and issues…an olla podrida, a salmagundi, a gallimaufry,a hodgepodge. A place to celebrate, communicate and vent. A place to share things that may be interesting or useful or different. So my mission statement is that I don’t have a mission other than to write, record, photograph and video things. Sometimes I’m overwhelmed by the beauty of things and I’m keen to share them. I’m old enough to know that I’m not going to change the world but am too stubborn not to try. I’m old enough to know you can’t dictate to people what to think but would be satisfied with people just thinking. So this is my first entry. It’s abstract and loose. It’s a start.